The power of the LiveBook GFX LE now with touch screen support. AJT’s newest product, the LiveBook GFX LE Touch brings touchscreen optimized operation and a tablet form factor to AJT’s product lineup. This is a first of its kind offering in the industry combining high end graphics with this feature set. Also ground breaking is the inclusion of graphics transmission over wifi and a powerful graphics switcher user interface. With graphics packages, logos and teams all preloaded your sports production will truly be plug and play. The LE Touch’s 15″ screen and lightweight design is a go anywhere solution. Includes full motions graphics, scoreboard and statistics interfaces. AJT Systems introduces the latest in it’s lineup of sports graphics products the LiveBook GFX LE touch. Building on the success of the LiveBook line the LE touch brings a touchscreen tablet form factor with a new user interface that is fully optimized for touchscreen operation. 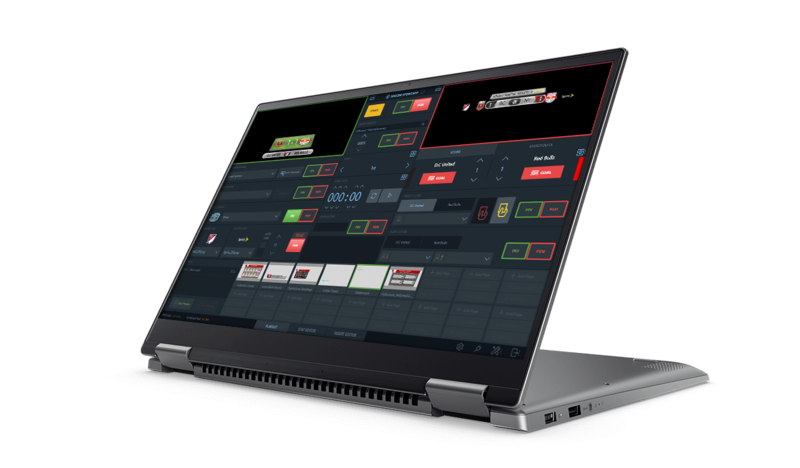 For an impressive live demonstration of the LiveBook GFX LE touch and the full AJT Systems Product Line, come visit us at NAB SL5516 in the NDI Pavilion. The Touch Optimized Playout (TOPTM) user interface in the SportApps 3.0 was created to bring an exciting and revolutionary “graphics switcher” experience to real-time graphics enabling ease of use and consistent playout by any operator. A new feature of the TOPTM user interface in the SportApps 3.0 is the ability to take a Page, a Playlist or a Clip to the Preview or the Program channel with a single touch from within the Playout Tab. This exciting new feature will also allow users to create and quickly playout Playlists of Pages, Header Messages, Sponsors, Score-Bug and Go To break. In this new section the operator can also play Clips directly to the Preview or the Program Channel without the need to create pages. Quick Action Buttons contain a graphic preview of the template for easier identification of each page. Opta Sports is now part of the AJT Systems LiveBook GFX real-time statistics providers. Please contact us through the Dashboard to obtain a copy of the Plugin. AJT Systems will be demonstrating at NAB 2018 the dual NDI channel capability of the LiveBook GFX NDI and SDI systems. This feature is currently available to all customers.